TYPICALLY, MY HUSBAND and I don’t meddle in our two adult daughters’ lives. We don’t intrude or hover like helicopter parents. Advice is given only when sought. We’ve learned it works best that way. And so their dad, an automotive machinist, steps in to help whenever he can, in person or with advice over the phone. He has the knowledge and the skills to problem-solve nearly any mechanical issue. Yet, though, because of distance—our second daughter now lives in eastern Wisconsin—or circumstances (like a broken down car parked at a St. Paul gas station), he can’t always assist. He’ll offer his suggestions and the daughters have to take it from there. Recently our 25-year-old daughter, the one who lives in Minneapolis, decided she wants to purchase a different car to replace her 1995 Geo Prizm. She’s driven her Geo since high school and it’s starting to show its age. While she’s been researching cars online, we did a little car shopping of our own for her when we were back in my hometown of Vesta recently. We found three possible vehicle replacements. Here they are in no particular order, with as much information as was available about each. 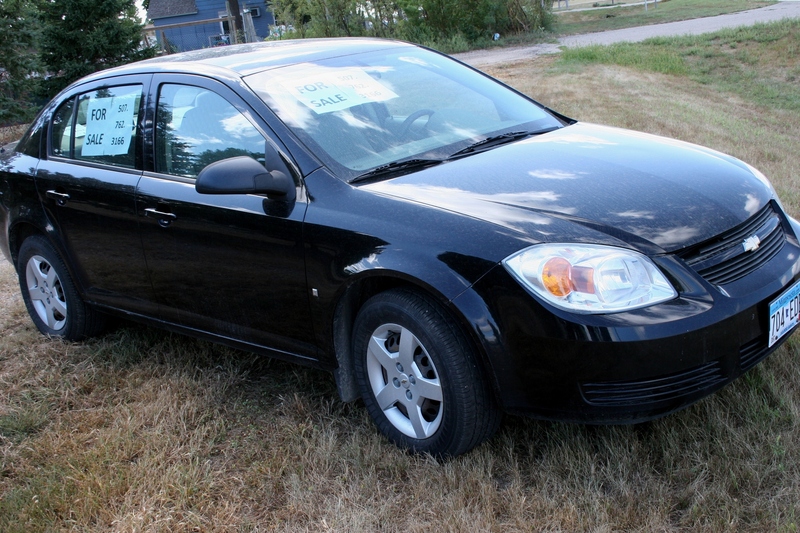 A 2002 – 2006 (the automotive machinist was uncertain) Chevy Cobalt. Clean interior. A 2008 Ford Focus one-owner, never-smoked-in (yeah, important point), with new tires (plus), clean interior (bonus), 34 – 40 mpg (yahoo), and only 57,000 miles (nice number). However, the car was priced at $12,000, about double our daughter’s budgeted amount. The "Vanuck," which did not have a "for sale" sign posted on it, but sat in the Dave's Auto Used Cars lot. 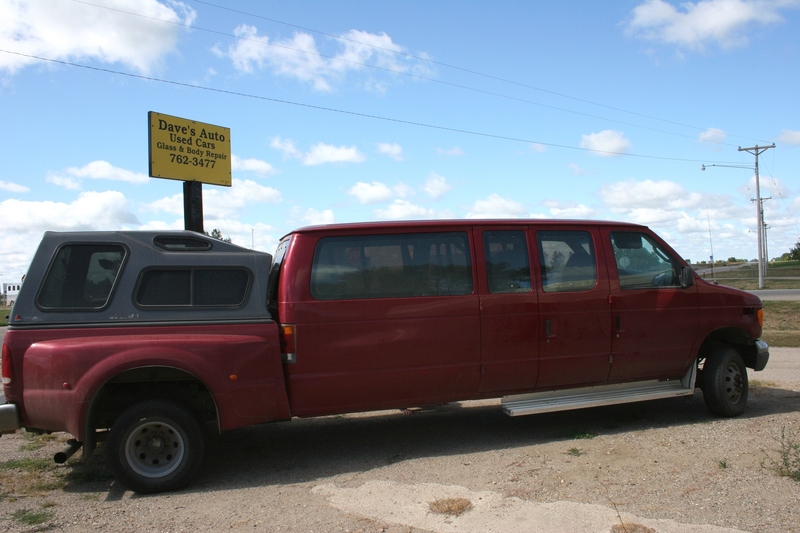 A truly one-of-a-kind Ford vehicle that cannot be defined, so let’s call it a Vanuck. 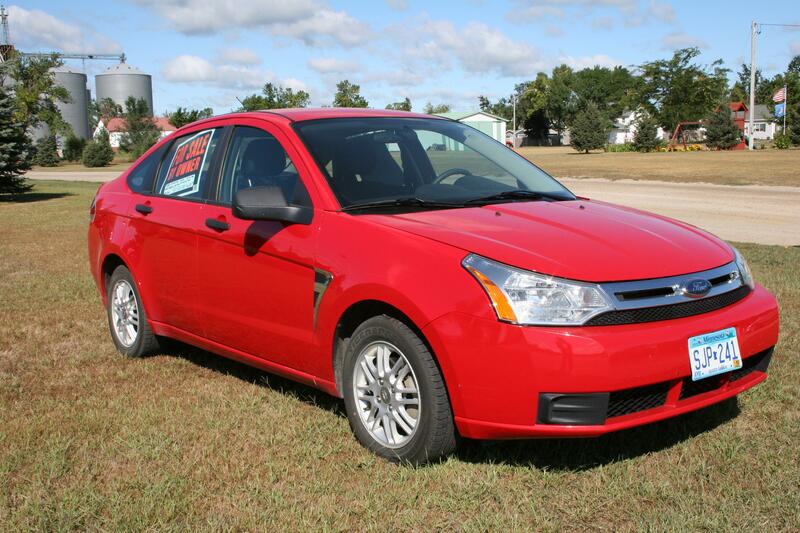 Front features a roomy 11 – 12-passenger van (great for transporting our daughter’s many friends). Back features a spacious storage area for bikes, tents, groceries, whatever (bonus). Appears well-constructed with a strong weld and new under-body framework (good safety features). However, back door of van section cannot be opened (negative for passenger safety in event of an emergency). Mileage uncertain, but probably low (two thumbs down). Not likely to be stolen (two thumbs up). Size may make it difficult to maneuver (ahem, back up) or navigate through metro traffic. SO, WHICH OF THE ABOVE should we recommend to our daughter? Or should she/we keep shopping? Submit a comment. I’d like your helpful input.